RoséFest is sold out, but you can still enjoy Rosé at Sterling all summer! See below event description for details on how to receive an extra special pour of Sterling Sparkling Rosé & Syrah Rosé with your General Admission or Silver Experience tasting! RoséFest is sold out, but you can still enjoy Rosé at Sterling all summer long! Book your tasting experience online and reference code ‘ROSE’ in reservation notes section to receive an extra pour of Sterling Sparkling Rosé & Syrah Rosé with your tasting! Advanced reservation required to take advantage of this offer, valid thru 8/31/18 for 'General Admission' or 'Silver Experience' bookings of groups up to 8 guests. 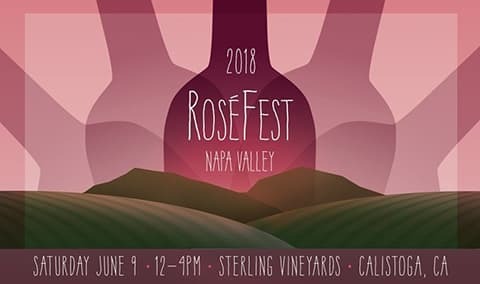 Whether you fancy yourself a wine novice or connoisseur, the Napa Valley RoséFest is a must for your Summer 2018 bucket list! Enjoy a day in the Wine Country, sipping sensational Rosé, noshing on fabulous food and giving back to the Susan G. Komen foundation for breast cancer awareness. All guests will enjoy access to the hilltop winery where a selection of Wine Country's finest Rosé producers will be pouring alongside several of the Bay Area's best restaurants. Guests will also have revel in access to the tasting tent on the lawn featuring live music, food trucks, and great Rosé! All guests must be at least 21 years of age. This event was fun extremely well organized, and so much Rose! , We had a blast and highly recommended this Festival. Sterling Vineyards' host was wonderfu,l the wines were wonderful, the band was great, the food was fun and tasty. Definitely recommend. Loved the event and will definitely attend next year. Great location, great wines all to support a great cause- Susan B Komen.